I’m the oldest in my family. I am responsible, a leader, an A-type personality; add to that mix a chronic medical condition where control is the ultimate virtue. In hindsight, it’s pretty easy to see how I ended up thriving on order, personal discipline, and planning to an unhealthy degree. Planning became my constant setting: meals, activities, shopping trips, work activities, kids’ activities, exercise, etc. My calendar provided me a sense of control, peace, and happiness. I “knew” what I was going to be doing 2 Fridays from now. Things felt under control. I even drafted an “Ultimate Day Plan” which outlined my activity, practically down to the minute, starting at “5:15 a.m. – waking to go to the gym/pool” to “9:30 p.m. – bed/reading”. This plan helped me feel like I could fit in all my personal needs, job responsibilities, family tasks, and quality time with my kids. I figured if I found the right formula one day; why not just keep repeating it? However, in little honest moments, I started to feel a sense of purposelessness. If I knew what I was going to do (or planning to do) every day for the rest of my life – what fun was that? Where was the spontaneity? What about being surprised by something joyful or unexpected? But, I would quickly push that feeling away and focus on whatever needed to be done or planned next. Then, in the summer between my junior and senior years in college – I went to visit my boyfriend who was stationed with the Marine Corp on Okinawa, Japan. To make a VERY long story short – he broke my heart (yet, didn’t actually break-up with me). I returned to California after a two week trip an emotional wreak, jet lagged, and about to start my senior year of college. What ensued was my first experience with anxiety and my only bought of depression (to date). Every other day I’d have a new epiphany to explain what happened, how I should feel, how everything was going to be alright, etc. I also suffered insomnia brought on by jet lag coupled with anxiety. It was the darkest time of my life. The college boyfriend and I stayed together and the pieces of my life fell back into place by the middle of my senior year. After graduation I moved to the Oceanside area to be near my boyfriend, who was stationed at Camp Pendleton. My first job out of college was at a law firm in downtown San Diego. There I met Dennis and the next chapter of my life started. Even after moving on to a new relationship, new city, and new life – after effects of that horrible bout of anxiety stayed with me. I longed to feel secure, comfortable in my surroundings, and at peace. Mostly, I yearned for some assurance that I wouldn’t be traumatized by something unexpected, ever again. Between the diabetes diagnosis and that devastating trip to Okinawa – I feared another bad thing happening that I didn’t see coming. When I married Dennis, a lot of the demons went away. The baby stage was blissful; I thrived under the discipline required to be pregnant with type 1 diabetes. Monitoring my blood sugar constantly made my world feel controllable and I loved the gold stars I’d get from the medical team. That sense of accomplishment was amazing. Becoming and being a mom fulfilled me deeply. Being able to convince yourself that you can stay happy all the time is, on some level, a reflection of a very blessed life. Until you’re not happy… then what? I recently finished a great book that I’m eager to share with everyone! Crown of Dust has been on my goodreads “To Read” list for a couple of years, ever since I saw a review in the St. Mary’s College Magazine. The author, Mary Volmer, attended SMC at the same time I was there (I recall watching her play on the basketball team!). 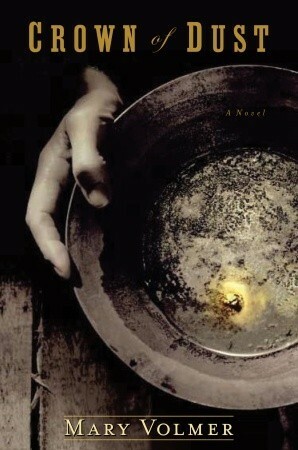 The story sounded intriguing and I wanted to support a fellow Gaels’ debut novel. What an wonderful read! Volmer’s story is set in the California Gold Rush and specifically in the northern California region stretching from Sacramento to Volmer’s hometown of Grass Valley. This was fun for me as my husband was born and raised in Marysville (just north of Sacramento) and we visit that region regularly. The protagonist is a young woman named Alex who has ventured west not to strike it rich but to escape her past. In order to reinvent herself, she masquerades as a young man and joins a motley crew of fellow gold diggers at the Victoria Inn. The inn is the center of a tiny town called Motherlode and run by the matriarch of the community, Emaline. Alex struggles to contain her secrets after striking gold as the little town begins to grow rapidly, bringing more women, law, and civilized society. The aspect I most enjoyed in this book is the way Alex is able to establish a sense of home and family amongst a group of strangers, in a relatively short time. The contrast between her femininity and the very masculine spaces of gold mines, saloons, and brothels is striking. The two main characters are both women: Alex and Emaline, in a mostly male environment. The way they each have to compromise themselves to survive is harrowing. As a Northern Californian, the Gold Rush has been a mysterious, mythical quality in my imagination. This story made that period of history come alive and feel relatable. The writing is brilliant. Volmer’s descriptions are vivid and clear and the depth of research on the era shown through in several sections. Alex’s past is illuminated through short flashbacks that provide enough explanation for her emotional state without drawing the reader away from the main storyline. There are several characters who are struggling in this novel and the suspense builds until the very end. Welcome to Be Still and Know! Hi! I’m Kelsey and this is Be Still and Know. I’ve VERY excited to be starting my own blog and sharing it with the world. My thoughts regarding this blog keep bouncing around in my head because there are so many topics and ideas I want to explore, discuss, and write about here. That’s the beauty of a blog – it can be whatever I want it to be! I love to learn and discover new concepts. Education for its own sake was the motto of my undergraduate program and that philosophy has shaped my life, ever since. I’m curious – (my parents love to tell me that as a toddler I constantly asked, “What’s that?”) Curiosity has always been in my nature. I find lots of different topics interesting – all of which I’ll write about here. So, let’s start with the title. Why Be Still and Know? Obviously, it refers to Psalm 46: Be still and know that I am God. Psalm 46:10 ESV. My faith in the triune God – the Father, Son, and Holy Spirit – is fundamental to my worldview and being. I couldn’t imagine putting my thoughts out into the world without expressing my faith and putting Christ in the center of everything. Be Still and Know also refers to a related topic; what I refer to as my “awakening”. This past summer I went through some emotional turmoil (which I’ll discuss in LOTS more detail later). The main lesson I learned during this intense period of growth was to live in the moment and rest in God’s peace, rather than plan incessantly in an attempt to stay “happy” all the time. Being still, rather than filling every minute with doing, planning, and thinking ahead to the next activity, has been liberating and brought me to a much deeper peace, His peace. The transformation has been incredible and I have to share what I’ve learned with you all. Through this blog, I am looking forward to making connections with other people, because that’s what I’m passionate about. I’m an extrovert and get my energy from other people. I love hearing people’s life stories, finding out what makes them tick, and exploring the interpersonal aspects of groups. Curiosity strikes again! For several years I’ve blogged about one topic in particular: diabetes. I’ve had Type 1 Diabetes since that fateful day in the summer of 1993 when my pediatrician smelled my sugary breath and proclaimed the diagnoses. After years of following my favorite character, Stacey McGill, in The Babysitters Club series, I knew what diabetes meant and that my life would never be the same. Luckily, medical advances have allowed diabetics to live a very full life. It was very fulfilling to blog about my pregnancies which were healthy, happy, and successful! Although this disease is a part of me, it’s not the only topic I want to write about anymore. That said, posts about diabetes will inevitably find their way into this blog because this disease and its effects are deeply ingrained in my life. As a natural expression of my curiosity, I love to read! If given a couple uninterrupted hours to spend however I choose, I’d head to a coffee shop with a book, every time. Books expose me to thoughts, ideas, feelings, and stories that change the way I think, feel, and understand the world. Pure bliss. I’ll share what I’m reading on here too. I’m a wife and mom. My family is everything to me. I work full time as a Manager. I have discovered a lot about myself by managing others and enjoy learning about management skills. Exercise is a regular part of my life – running, swimming, and hiking/walking, mostly. Eating a low carb or Paleo diet helps me to keep my blood sugar levels manageable and allows me to focus on all the other wonderful aspects of my life. I’d be honored if you joined me for the journey. 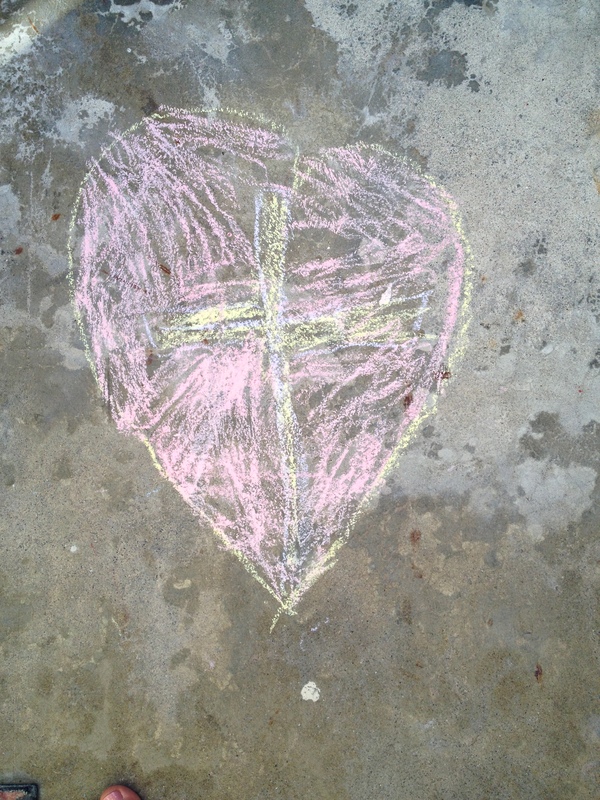 My daughter’s favorite doddle – a heart with a cross inside.